It's Sunday, so it's Christmas Club! We're getting ever closer to the Big Day itself﻿ and the excitement is building here at High In The Sky. How about you? "The best thing that ever happened to me was when I won a colouring competition to visit Santa in his grotto. I was in P2 and it was coming to the end of a very boring day at school. Just the thought of watching a DVD, that I had already seen twenty times before, for another half an hour to wait for my brother, made me yawn. As I was younger I got out earlier and had to go to 2.30 Club to wait for him to finish. We had just written down what page to read for homework when my teacher lifted a pile of envelopes off her desk and started to hand them out. When I received mine, I realised that it had my name and school on it, If it was being handed out by the school, why would it have the school name on it? I ignored that and put it in my satchel. When I got home I completely forgot about my letter and concentrated on my homework instead. When I was watching tv after tea, I noticed my Santa letter, which was to be posted that night; and I remembered my letter from school and got my mum to read it out. I had won a colouring competition! 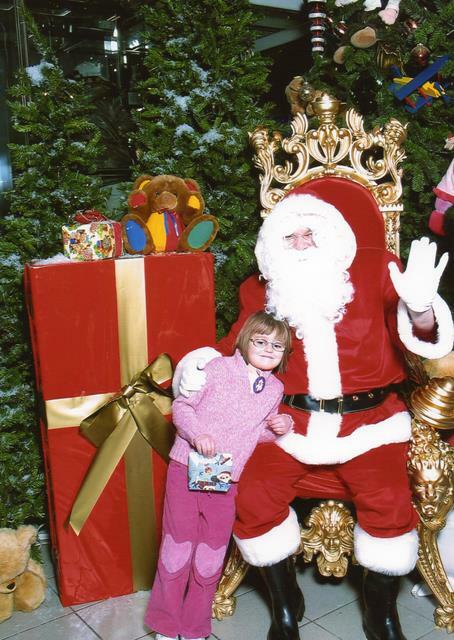 I was to visit Santa in a shopping centre that Saturday! Next morning I asked everyone about their letters and their letters had only said Thank you for entering the competition! When it came to Saturday, I was SO excited! When we got to the centre, my mum and brother watched from the balcony while my dad and I visited Santa. I got a V.I.P. pass and went to a V.I.P. queue. When it was my turn I sat on Santa's knee before getting my photo taken. He gave me a present (which was a purple purse) and I skipped away happily. Even though I wouldn't really enjoy that trip now, I loved it at the time and found it truly magical. I still have that purse now and I have used it loads. That was the best thing that ever happened to me. " Thanks for sharing TSO :-) Winning a colouring competition is a momentous occasion, let alone one that leads to Santa himself! Oh, that's a perfect CC story ~ I actually had a tear in my eye. I hope to be back later with a CC story from my mum. It's obviously a day for sharing CC stories with mums! What a lovely story and I can see that the small one has inherited her mother's talent for story telling. What a lovely story,TSO.....and it reminded me of when my DD won a christmas colouring competition....her prize was a Minnie Mouse.....and she still has that as well. What a great memory that TSO will cherish forever! What a great memory to have and what a way with words she has. such a wonderful story! thanks for sharing your christmas magic with us. Great story!!! Sian, I can't tell you how much I LOVE Christmas Club. Thanks so much for starting it up in blogland. A wonderful story and a great memory for the Small One. Lovely story and how funny that we both posted stories today from our children's perspective! What a lovely story, you can tell your DD has her mothers love of story telling. That would bring a tear to a glass eye! how sweet!! Sigh! What a great story beautifully told...The Small One has certainly inherited your story telling genes!! Love it, The Small One :-) Thanks for sharing her story with us, Sian! PS Have linked up now - thanks for prompting me! Passed on your writing talent I see! Sweet story! Another lovely memory, and told so well. Awww!, bless her. What a magical memory to keep. I am a bit behind this week (finalpush at school)but hope to catch up with the christmas club very soon.